The Week in iOS Apps: Hulk out! This week’s roundup of iOS apps offers ways to Hulk out, enjoy the start of football season, and carefully plan your divorce. Yeah, that last one’s a bummer—but also a reminder of how the iPhone and iPad are creeping into every nook and cranny of our lives. You wouldn't like him when he's angry. See below. Already this week, we brought you roundups of the best movie and business and productivity apps. We also told you about the very first iOS client for the App.net social media network, AppNet Rhino. Avengers Initiative: HULK SMASH! 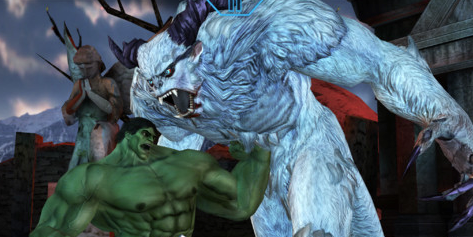 (Clears throat) Actually, what we meant to say is that the Hulk is a smash in this new $7 game for iPad and iPhone from Marvel Entertainment. The storyline is that the world’s most dangerous monsters and criminals have busted out of S.H.I.E.L.D’s holding pen in the Rocky Mountains, and the Hulk is tasked with rounding them up. Marvel promises that the game will evolve over time, suggesting that Thor, Iron Man, and Captain America will join the adventure in the near future. Digg: When the remnants of this once-prominent social news service were sold for a measly $500,000 earlier this year, the widespread assumption was that Digg was dead. Instead the service is trying to reinvent itself as a pioneer of a burgeoning “slow news” movement—something closer to Zite than the newsranking service it used to be. The latest updates to Digg’s free iPhone app put that evolution on display, letting users read top stories and share them to Facebook and Twitter, yes, but also save them to Instapaper and Pocket for later, more contemplative reading. The app also includes a new “Paperboy” feature—just tell it where your home is, and everytime you leave, it’ll download the latest news for offline reading on your commute. Ya Digg? 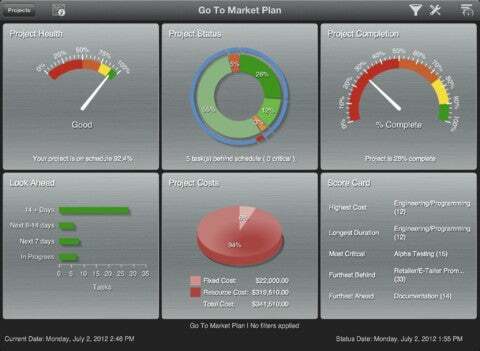 FastTrack Schedule Go offers a dashboard view of your projects. FastTrack Schedule Go: Workplace project managers are getting a little more iPad help, now that AEC Software has launched the $10 FastTrack Schedule Go productivity app for iPad—a companion to its FastTrack Schedule 10 software for personal computers. The app lets users track project progress, schedule tasks and deadlines, view dashboard overviews of what’s been done and what is left to do, and share those dashboards as PDFs and PNGs via Dropbox and other sharing services. 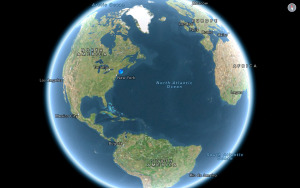 Gradometer: It’s back-to-school time, which makes it a great time to pick up this free iPad app from James Duncan. Gradometer lets students download syllabi from their classes, then enter the grades they get on each project in that class—allowing them to track their likely end-of-semester grade in real time. A “temperature gauge” even tracks your performance compared to your classmates, letting you know just how much work you have to do to spring to the head of the class. Hurricane by American Red Cross: Yes, Hurricane Isaac has come and gone, but Mother Nature could always have more storms up her sleeve. That’s why folks in storm-prone areas might find this free iPhone app useful: It lets users monitor weather conditions in their area, find Red Cross shelters when disaster strikes, and customize “I’m safe” alerts to let friends and family on Facebook and Twitter know that you’ve endured. There’s even a step-by-step guide to storm survival that’s available for offline use—just in case the hurricane leaves you without a Wi-Fi or cellular data connection. iSplit Divorce: We’re used to thinking of the iPad as a joyful device, but it’s become so prevalent in so many sectors of society that it naturally gets used for grimmer tasks as well. The $10 iSplit Divorce app for iPad is built for one of those tasks—the end of marriage. Couples that are splitting up can use the touchscreen to drag and drop icons representing their community property, divvying up who gets the CDs and who gets the bookshelves. Developer George Moskoff suggests that using the app can save on attorneys fees—but that’s probably true only if the split is relatively amicable. 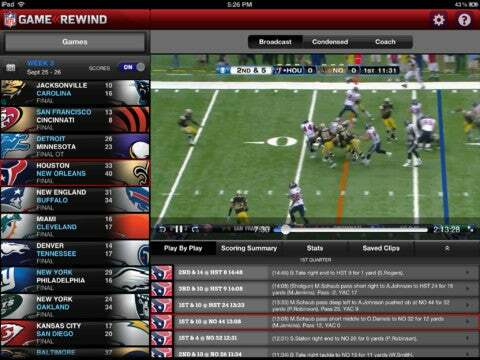 NFL Game Rewind lets you watch games and track scores. NFL Game Rewind/ESPN Fantasy Football 2012 for iPad: Are you ready for some football? Your iPad is, thanks to two new apps. The free NFL Game Rewind lets you track scores, watch full games—only after the fact, not live—and includes a Telestrator feature so you can diagram the action. For full video access, though, you’ll have to pay $70 for a full-season pass. And if you want to add an extra layer of game to your game, there’s also the new ESPN Fantasy Football 2012 for iPad—which, as you may have guessed, lets you play fantasy football. Other apps of note: Adobe Photoshop Touch has been upgraded for Retina support … KickStarter Gallery has launched to feature that site’s crowdsourcing projects … and NYTimes for iPhone has been revamped with a greater emphasis on featuring photos on the main pages.